December is a good month for book sales, but last month was the best month ever for Beyond Batting Average in terms of online sales. I sold 56 books which surpasses the 55 I sold in December, 2010 when it was listed among Baseball America's top ten books of 2010. This time, it sold without much promotion. I have been depending mostly on google searches and word of mouth (or keyboard). Most of the sales have been for the hard copy version of the book. Not as many people know about the less expensive e-book that can only be purchased on Lulu.com. 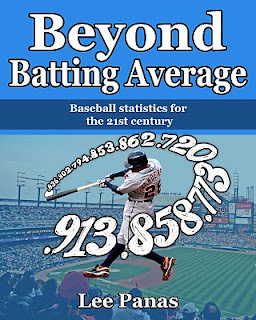 You can now purchase the e-book version of Beyond Batting Average for $4.00 on Lulu. The hard copy version costs $14.00 (also available at Amazon). I believe that Beyond Batting Average is still the most up-to-date and comprehensive sabermetrics primer available. It is accessible to fans who are trying to learn sabermetrics and would like a more organized and broader presentation of the subject than you'll typically find on the internet. The fact that Tom Tango uses it as part of his introductory sabermetrics course should tell you that it's still very relevant. My book serves as a good introduction to more advanced books such as The Book by Tango, Mitchell Lichtman and Andrew Dolphin.